At West Broadway Dentist, you’ll find a warm staff that genuinely cares about your dental health. 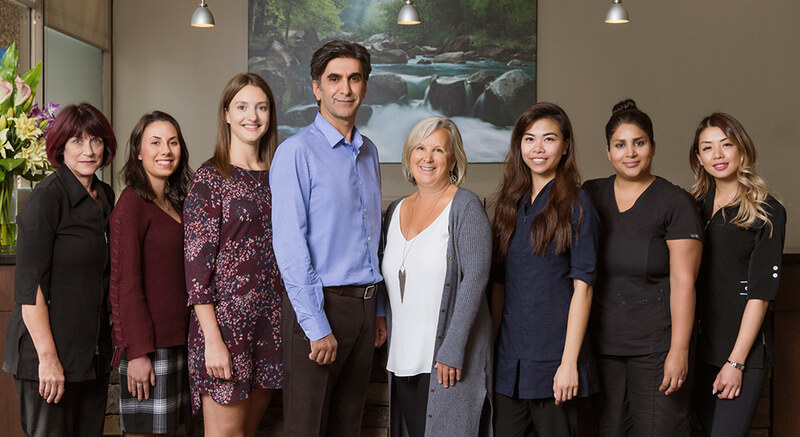 From our front desk staff to our experienced dentists, everyone in the office works together closely as a team to develop a treatment plan that will meet your needs. 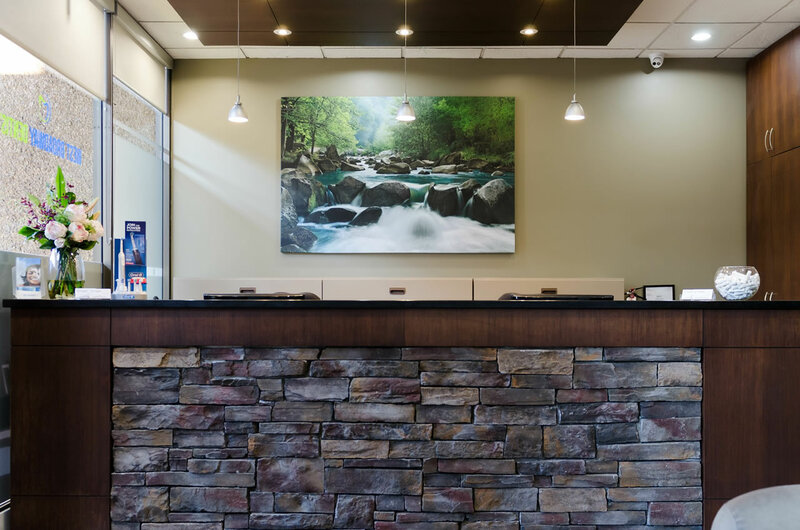 We don’t just focus on the notes in your file — we strive to form strong relationships with our patients, so you’ll always feel comfortable and welcome when you enter our office. Our expert team offers routine preventative dental care, general dentistry services, restorative treatments, and cosmetic dentistry. We want you to enjoy a relaxing experience taking care of your smile. Our focus is on maintaining the health and appearance of your mouth, so you can enjoy beautiful teeth and a comfortable bite. You’ll feel at home in our cozy yet modern office space. Settle in and enjoy the peaceful artwork, or grab a magazine and unwind as you wait for your appointment. We provide our patients with a genuine experience from one caring human being to another, where you’ll always feel like an individual and receive a highly personalized treatment plan. Book a consultation today to personally experience the difference our expert dental care can make. 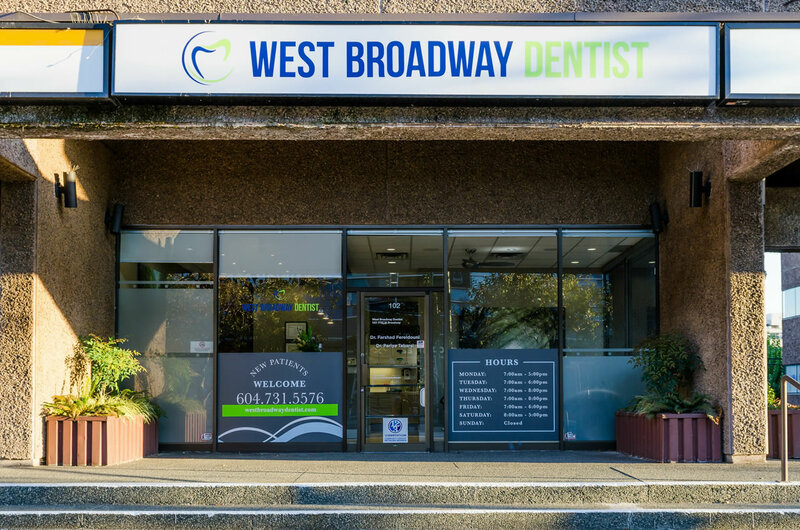 West Broadway Dentist is conveniently situated in the vibrant Kitsilano neighbourhood, which is a popular hub for some of the best dining and shopping in Vancouver. You can stop at Bed Bath & Beyond, grab a lunch at Little Sheep Mongolian Hot Pot, and pick up a few essentials at Shoppers Drug Mart, all within a few steps of our doors. This is a hub for local health care services as well, with several physicians’ and specialists’ offices along the same street, and Vancouver General Hospital less than five minutes away. Our central location makes it easy for patients to drop in before work, at the end of the day, or on a lunch hour. We offer flexible scheduling with this in mind. If you don’t have time to complete a lengthy treatment in one visit, we can break it up into several shorter sessions for you. Just let our helpful front desk staff know what you need. We’re happy to work with you. Appointment confirmation and reminders through either email, phone call, or text message. When you come to West Broadway Dentist, you’re greeted as a friend and cared for like family. Welcome to a new type of dental experience. We confirm appointments by either email, text or phone call – whichever you prefer. West Broadway Dentist has been a staple in the Vancouver area for many years. The office was originally run by Dr. Chris Hacker, who continued to practice with us until April 2017. 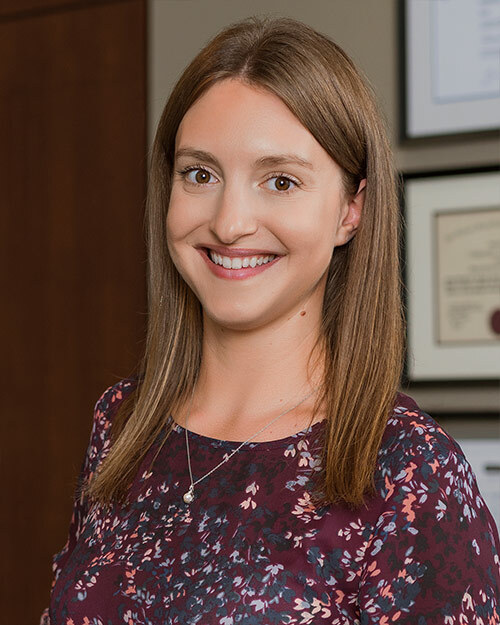 Though Dr. Hacker has since moved on to serve as Director of Professional Practice and Deputy Registrar for the College of Dental Surgeons of BC, we here at West Broadway Dentist are proud to uphold many of the same values that Dr. Hacker embodied for his loyal patient base. Dr. Hacker built a dental practice focused on relationships, which we continue to maintain. In 2013, Dr. Kevin Aminzadeh purchased the practice from Dr. Hacker. West Broadway Dentist changed hands again in August 2015, as Dr. Farshad Fereidouni took over as owner and operator. At our practice, you’ll find that Dr. Fereidouni and his staff are deeply and personally invested in your comfort and happiness as well as your health. We continue to provide the same level of care and concern that has made this a successful location over the years. Our office is conveniently located on West Broadway between Burrard and Granville Street, with plenty of parking nearby, including two stalls under our office and street/metered parking in the front of our office. At West Broadway Dentist, we have two experienced dentists on staff to address your needs. Dr. Fereidouni graduated with a Doctor of Dental Surgery degree in Iran in 1993. When he relocated to Vancouver in 2010, he ranked in the top 4 per cent of the equivalency program administered by the National Dental Examining Board of Canada. He has pursued continuing education in the areas of endodontics, prosthetics, implants, cosmetic dentistry, and Invisalign. 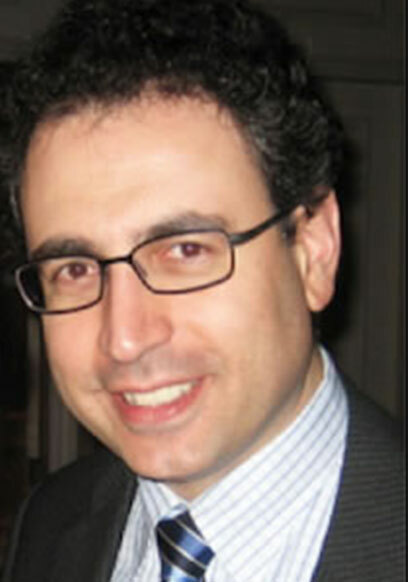 Dr. Fereidouni is a member of the Canadian Dental Association, BC Dental Association and College of Dental Surgeons of BC. 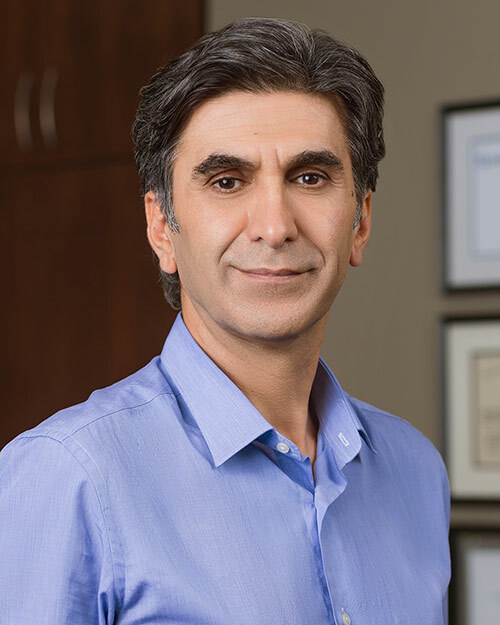 Dr. Ajar received his Bachelor of Science in Anatomy from McGill University in 1991 and his Doctor of Dental surgery in 1995. After graduating, he completed postgraduate training in hospital programs with rotation in oral and maxillofacial surgery, anesthesiology, internal medicine, general surgery, emergency medicine, pain medicine, and surgical intensive care. He has now limited his practice to dental surgery and implants using sedation. 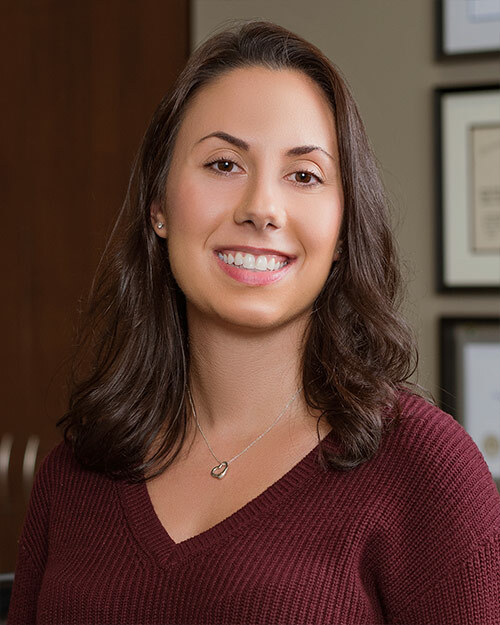 Dr. Katie Chung received her Doctor of Dental Surgery from the University of Toronto. Her interests lie in cosmetic dentistry, oral surgery, periodontology and paediatric dentistry. Dr. Chung prides herself in gentle dental and a lifelong journey of learning. 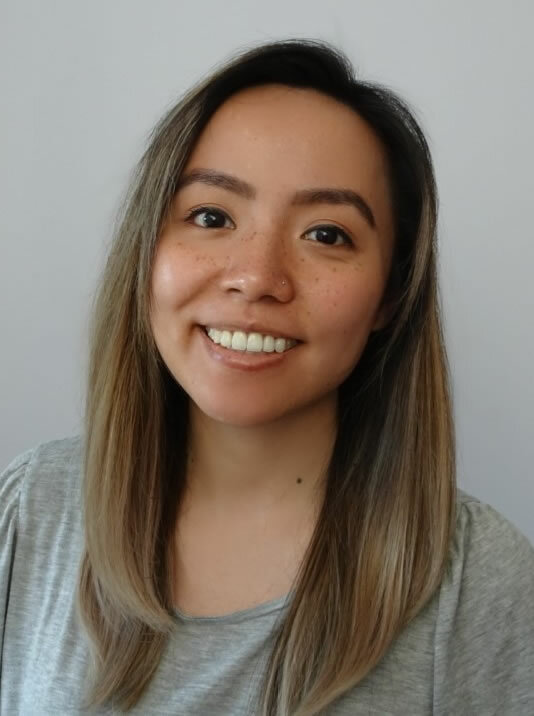 Having grown up in the Arbutus Ridge and Kitsilano area, Dr. Chung is pleased to join the West Broadway Dentist team and she looks forward to meeting you. Amazing dentist, hygienist and awesome staff! Highly recommend. For the first time in my life I don’t dread going to the dentist as they got everything (root canal and crown) done in a very accommodating and painless way. Now we have regular cleaning and checkup appointments and I can proudly declare my mouth healthy thanks to the team West Broadway Dentist! Anita is my dental hygienist and she is amazing. She remembers to ask me about my dog (love, love, love) and was thrilled to hear about my new job. She manages to understand what I'm saying in spite of my mouth being full of cleaning implements! She is efficient and very effective - she eliminated every stain! I have been coming to this office for years, and appreciate the friendly, personal service all the staff provide. I miss Dr. Hacker, but still love my visits! Thank you! This remains, in my opinion, the best Dental Office in Vancouver. Maureen is without doubt the very best Dental Hygienist ever. Four stars - well it IS the dentist! I love the care and service West Broadway Dentist offers. I get regular reminders, so i don't miss my appointments. It's a lovely cozy clinic, and my dental hygienist is warm, friendly, and thorough. I love that she always give me tips on how to care better for my teeth and gums and is always encouraging. I highly recommend this dentist. Always a pleasant and professional experience. The doctor is knowledgeable and comforting and the staff is friendly and very accommodating. I actually love coming here. West Broadway Dentist is proudly owned by Dr. Farshad Fereidouni and Dr. Amin Shivji.